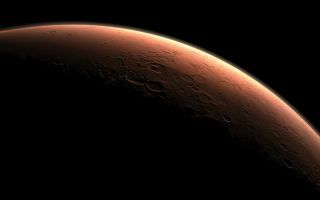 In this space wallpaper, a computer-generated view depicts part of Mars at the boundary between darkness and daylight, with an area including Gale Crater beginning to catch morning light. Northward is to the left. Gale is the crater with a mound inside it near the center of the image. NASA has selected Gale as the landing site for the Mars Science Laboratory mission. The mission's rover will be placed on the ground in a northern portion of Gale crater in August 2012.